Whatever game you think of when you imagine the wonderful VR future we’ve all been hurtling towards since Oculus announced their headset, it’s wrong. 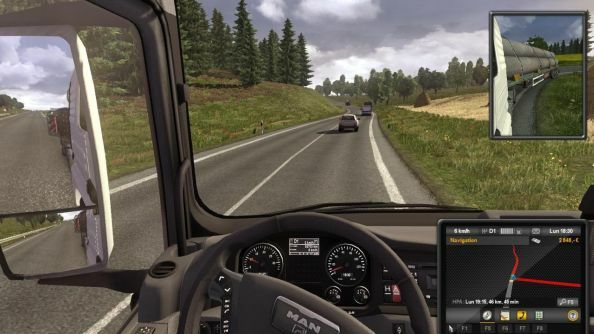 Cast it from your mind, and replace it with this: the 1:1 simulation of driving a truck from one point in Europe to another. Our Steve spent twenty minutes taking on the duties and lexicon of a trucker in February, driving a many-wheeled thing from London to Rotterdam*. He had quite the time, and I only hope the addition of beta Rift support – minus the rear view mirror and high-res, for now – doesn’t see players forgetting about their 15 minute service station breaks once every few hours. That’s the law, you know. *Which ordinarily takes a little longer than 20 minutes, yes. That part of the game isn’t quite 1:1.